Following the Lehmann disaster in 2008, more attention is being paid on the equity ratios and credit worthiness of banks in general. Back in 2011 - world wide 29 banks were named as so called "mega banks", being a bank which has "system relevance" , due to its size and therefore is "too big to fail". Of those 29 - three are Japanese- Sumitomo Mitsui, Mitsubishi UFG and yes- Mizuho. I am not really into banks all that much, but believe you can see Mizuho as the Japanese JP Morgan- big in corporate liaisons and development. 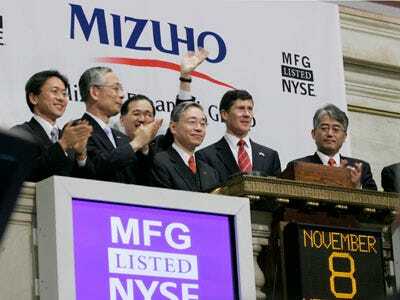 Fas...While not familiar with Mizuho....I thought the use of a Japanese bank was indeed interesting. Doubt there is any significance. Someone at Cytori new someone a mizuho, is my guess. Maybe our ne CFO? Could be WST, could be. Either way....the sooner we get this debt off the books the better. That Girao has international contacts as a Brazilian is very likely. However surely none in Japan. With both KPMG and NuVasive the chance was minimal. No- for business development this is very interesting.... and dangerous. I have a bad feeling about this all and do not trust Hedrick (and the BOD) for one cent. I have that same feeling due to the few warrant conversions ($700000) Atm & Warrants. Have you found anything in writing about Sabby's purchasing more units. As usual - everything except 8K´s or 10Qs and Ks from the Company itself are pure speculation and "careful translation" and "interpretation" of the grapevine. As occurs often with Cytori- even May 15 information on insti holdings will be kind of irrelevant , due to the waterfall of shares that has been thrown on the market. I am not sure how some folks still manage to look in the mirror when they wake up. What could be bad ? Buyout or BK ? Either way the pain ends !!! Clown make-up applied thickly and a big red nose hides much...LOL ! Be happy Fas, its nearly story time again. That is what I have done, and tried to share a little bit as well.